Combine flours, yeast, salt, brown sugar and celery seeds in food processor and blend. Add milk while the processor is running and let knead for about a minute. Process 1 minute to knead. Place dough in a greased bowl, flipping over so that all sides are greased. Cover with plastic wrap, then a towel and let rise in a warm spot till doubled, 35-50 minutes. Flour baking sheet. Punch dough down and knead on lightly floured surface until smooth. Divide into 8 pieces. Form each dough piece into ball and place on floured baking sheet. Flatten balls slightly.Using a serrated knife, cut an X across top of each dough ball. Cover with a towel and let dough balls rise until almost doubled in volume, about 30 minutes. Preheat oven to 375°. Grease another baking sheet and sprinkle with cornmeal. Bring 8 cups water to boil and add baking soda and salt (water will foam up). Add 4 rolls at a tune and cook 30 seconds per side. Using slotted spoon, transfer rolls to the prepared sheet with cut side up. Repeat with remaining rolls. Brush rolls with egg white glaze. Sprinkle tops with coarse salt. 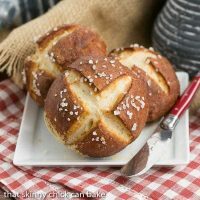 Bake rolls until brown, 22-25 minutes. Transfer to racks and cool 10 minutes. Serve rolls warm or room temperature. Technique adapted from Bon Appetit.